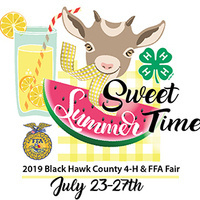 2019 Black Hawk County 4-H and FFA Fair! The Black Hawk County 4-H and FFA Fair highlight work of 4-H youth and FFA in the county. Exhibits and project entries include livestock and non-livestock projects from youth ages 5 years and older. Iowa 4-H follows the principles of experiential learning and draws on the knowledge base of Iowa State University and other institutions of higher education in cooperation with the United States Department of Agriculture. The Iowa 4-H Program’s vision and mission statements clearly view youth as partners working with staff and volunteers, and as full participants in planning and working for individual and community change.